Plum City – (AbelDanger.net): United States Marine Field McConnell has linked Serco spread-bet bookmaker frauds to the timing signals which appear to have triggered the 7/7 bomb in a London Underground train as it left Edgeware Road Station and the explosive decompression of MH Flight 17 after it passed the Tamak waypoint west of Donetsk on July 17. 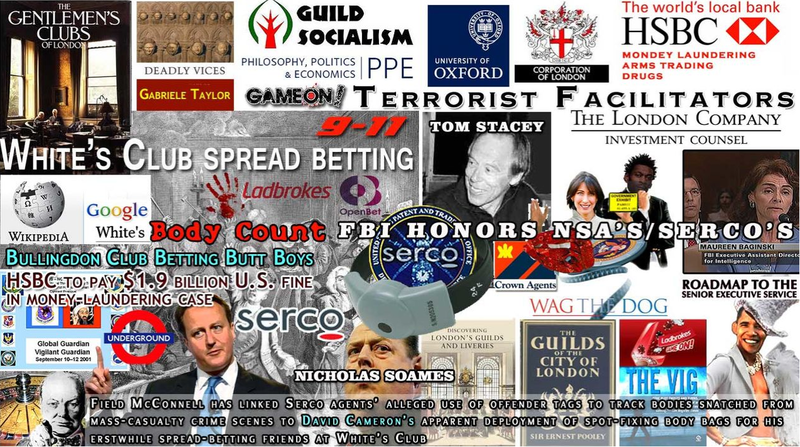 McConnell claims White’s Club gamblers and Serco directors placed “experts of unknown provenance” at both crime scenes for the spoliation of evidence of alleged Red Switch Network trigger signals and spot-fixing body counters in the Offender’s Tag Association who have apparently been sharing in Serco’s spread-bet “vigs” over decades of fraudulent mass-casualty events (cf. PanAm 103, Lac Megantic). Diverted Over Ukraine War Zone! BBC News 24 announced the first report of an explosion at Edgware Road at 09:39, claiming it was the second incident of the morning. ITV News first report at 09:33 that ‘London Underground state there has been another incident at Edgware Road station’. What was the reason for this delay in alerting the public to the incident at Edgware Road? At 09.17 there was an explosion on a train coming into Edgware Road underground station approximately 100 yards into the tunnel. The explosion took place on a train and blew through a wall onto another train on an adjoining platform. There were five fatalities and others injured in this incident. Three trains are believed to have been involved. This timeline of an explosion at Edgware Road at 09:17, the third in a sequence starting at 08:49 at Liverpool Street, remained the story for the next two days, before changing to 3 blast within 50 seconds at 08:50. This MPS account of the scene is also contradicted by the official version of events which claim the incident occurred on a train leaving Edgware Road. FOI requests to TfL26 have elicited the response that there is no wall between trains at Edgware Road and no train on an adjoining platform was affected by the blast. How did the MPS reach the conclusion outlined in this press release? Two of the young victims that are said to have died on the Edgware Road train, Jenny Nicholson27 and David Foulkes28, made journeys that contradict the official story. Ms Nicholson was traveling east from Paddington and Mr Foulkes was due to meet a colleague at this station after travelling west from Euston. How could Jenny Nicholson and David Foulkes have been on a train travelling west that had passed Edgware Road? First, I chose to meet 2 people that day who requested an interview with me while I was attending a conference in a London hotel. Having shaken their hands and asked where they were from I noticed I was being covertly filmed by one of them who denied it, although it was obvious. As it is not possible to have a civilised conversation when deceit from one side was apparent from the outset, I apologised that I could not help in such circumstances and suggested another time perhaps? I then walked back to the conference – suddenly pursued by 2 or 3 shouting people trying to make it appear I was fleeing? Second, it’s worth reminding some people that the London underground system has so far been the subject of terrorist bombings on 21 occasions, going back to 1885. Also, on the same day as our exercise, a major law firm in the City of London was running an exercise that involved bombs on the underground. A few days before so did a major German bank in London and even the Metropolitan Police. We were not alone. Third, our table top exercise was to involve a very small group of crisis managers under test, from a company employing c1000 people. No one was on the streets at all. Just one part of the scenario was similar to IRA incendiary bombs planted on the underground in 1992 to start fires on three underground trains, albeit the locations were by sheer coincidence, more 2005 that 1992. That’s not so surprising when we had a limited number of underground lines to choose from, given the location of our client in the centre of London. There will be no convincing some very odd people who think actors were on the bus that was actually bombed and the UK Government staged the whole thing on 7/7, the World Trade Centre was pre-wired with explosives on 9/11 and even that tragedy was a US Government setup. At a time when this country is under a sustained terrorist threat it makes sense to base any exercise scenario on realism and historical events and in so doing hopefully increase our overall resilience to this threat. Had the odd people I met on 12.12.07 bothered to have a proper conversation with me I would have explained all this to them but fantasists will, no matter what I say, always prefer sensationalism to sense and conspiracy to coincidence. “Malaysia Airlines confirms it received notification from Ukrainian ATC that it had lost contact with flight MH17 at 1415 (GMT) at 30 kilometers from Tamak waypoint, approximately 50 kilometres from the Russia-Ukraine border. Flight MH17 operated on a Boeing 777 departed Amsterdam at 12:15 p.m. (Amsterdam local time) and was estimated to arrive at Kuala Lumpur International Airport at :10 a.m. (Malaysia local time) the next day. The flight was carrying 280 passengers and 15 crew onboard. The Downing of MH17 – Is Israel Involved?